The frequency with which I bake with bananas is dependent on how many we buy that go uneaten. When I see them get to that lovely, ripe, baking stage, I start scouring my brain, all available cookbooks, and the internet for banana recipes. Having made banana bread too many times to count, I really wanted to bake something a little different. As I kept an eye on our latest batch of steadily ripening bananas, I remembered the glorious banana cupcakes at Billy’s Bakery, one of my favorite NYC bakeries. With those lovelies in mind, I started my search for something similar. That leads us to this cake. I am a big fan of this cake. It’s denser and sweeter than banana bread. And, of course, there’s cream cheese frosting, which is one of my all-time favorite things. My initial instinct was to bemoan only having an 8-inch square cake. On further contemplation, though, I think having more of it around would be dangerous. 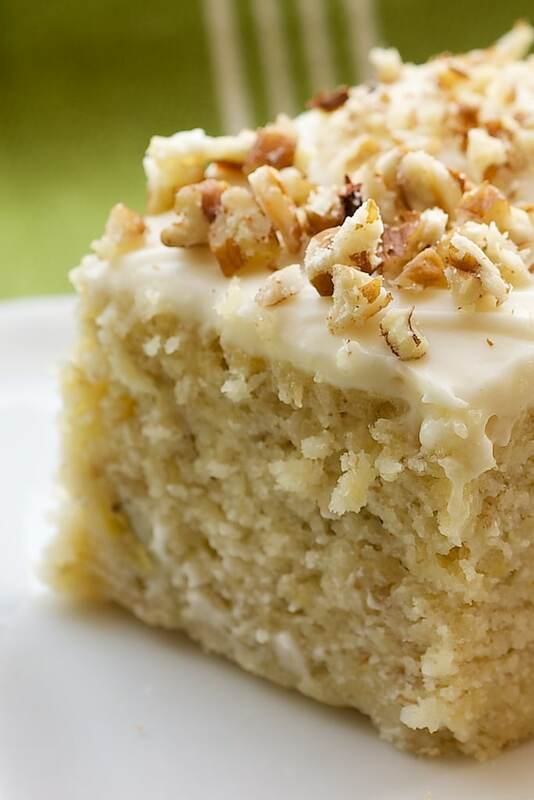 Banana Cake with Cream Cheese Frosting is irresistible with its dense banana cake and sweet frosting. Preheat oven to 375°F. Spray an 8-inch square pan with cooking spray. Using an electric mixer, beat the butter, oil, and sugar. Beat in the eggs and egg white, 1 at a time, mixing well after each addition. Mix in the vanilla. In a separate bowl, mash the bananas with the milk. Set aside. Gradually mix half of the dry ingredients into the butter mixture. Mix in the bananas. Mix in the remaining dry ingredients. Pour the cake batter into the prepared baking pan. Bake 40-45 minutes, or until a toothpick inserted into the center of the cake comes out clean. Cool the cake in the pan on a wire rack. Using an electric mixer on medium speed, beat the cream cheese and vanilla. 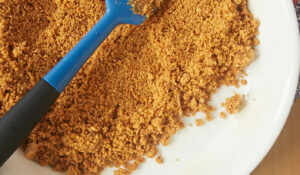 Reduce the speed and gradually add the confectioners’ sugar. Spread the frosting on the cake. Sprinkle with nuts. Recipe slightly adapted from All You. Omgosh, I can’t tell you how fun it has been browsing through all of your recent posts. Every recipe is absolutely mouthwatering! I pinned this recipe, I know everyone would LOVE it! yummy.is it required to use only canola oil?can we use any other oil as well? Merin, I usually use canola oil and that is what the original recipe recommended. You should be able to use another kind of oil if you’d like. Can you double this recipe and put it in a 13 x 9 pan??? Hi, Debbie. Yes, that should be fine. Wow, this looks amazing. Thank you for the great alternative to the good old banana bread. I just placed this into the oven…can’t wait for it to cool and then frost. The batter was a good clue of how delicous this is going to be! I just died a little! Already saved the recipe so I can do it right after Christmas. It looks great and I can’t wait to make it! I love the sound of this and cannot wait to try it. I wonder (being a non-baker), if peanut butter icing would be good. Could you just add a dollop of peanut butter to the cream cheese? Susan, Martha Stewart has a good recipe for a cream cheese – peanut butter frosting. Click here! Just wanted to let you know I made this cake for a luncheon at work this week and it was an absolute hit. People were asking for the recipe and taking bowl of it back to their desks. Another great recipe! I attached the link to my post if you want to take a look. Thanks again! I just made this cake and it came out extremely dense…I have NO idea what I did wrong…the only thing I can think of is that I blended the ingredients too long..any ideas? Andrea, that would be my first guess. I’m sorry you had troubles! Mine also came out very dense…more like bread not cake. You can add my attempt as also turning out quite dense. I bake quite a bit and haven’t had this happen in quite a while. I know the rule is generally 1 tsp. of baking powder for every cup of flour which this recipe does follow. Don’t quite know how to fix this one. I will definitely be making this again, so I will try and see if I can fix the problem. Not that it was a very big problem, because it was still delicious!! Thank you for the recipe! Mine also came out dense. Kinda like banana bread. This was not a hit at my house.. IT was very dry (tasted like flour)and more like a bread then a cake! maybe 2cups of flour is a little much. SAME AT MINE EVERY ONE WAS EXPECTING A CAKE NOT DRY BANANA TASTING DENSE FLOUR BREAD!!!! This was very tasty! Based on others’ reports of the cake being a bit dense, I added 1/4 tsp of vinegar to the milk and let it sit for 5 minutes before adding (pseudo butermilk) to help the baking powder do it’s thing. I also added a small amount of chocolate chips and a little butter to the frosting. It was a hit at our dinner party! I think it might have needed 1 tsp baking soda to make it less dense. I have a similar recipe and that was the only real difference. I used your ingredients and it was very dense, will try adding the baking soda next time. I am going to try this today. I was wondering if it can be doubled and baked in a 9×13 dish instead? I am debating on trying that or just making two different batches. I made this recipe and it was so yummy!! I did end up doubling it and putting it in one 9×13 dish. I also substituted buttermilk for the regular milk because buttermilk makes everything better. 🙂 I also added about a cup of peanut butter to the icing. Yum yum yum! Thanks for the recipe!! Jodi, I’m sorry I didn’t see your comment in time to answer. Glad it worked out! … and then i tried this, died & went to heaven. thank you so much for posting this. 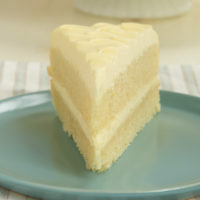 yes, the cake is more dense than your typical cake BUT, it works so well with the depth of the cream cheese frosting. i shared on my blog and credited you entirely for it’s awesomeness. thank you again for sharing… simply delicious! I made this today for Mother’s day dinner at my house. I thought it turned out good (my 2 1/2 yr old loved it!). I was wondering, though, when I was mixing it all together, was I supposed to keep mixing it with the mixer to incorporate butter/eggs, etc. with the bananas and flour mixture (or was I supposed to stir/mix by hand)? I’m not a big baker, so I used the mixer with the eggs and sugar part, but wasn’t sure about with the flour mixture. I did use the mixer for all of it and wondered if that’s why mine was a little dense. Just wondering…Thanks for any tips! Erin, you can mix or stir the flour mixture. Either way is fine as long as you don’t over mix. The cake is supposed to be dense, so it sounds like you did everything right! I found this today on Pinterest and made it and it is SO GOOD. I used buttermilk just because I had some. It is dense, but perfectly so. Will definitely make it again….thank you so much! I love your website! This is the first thing I have made from it. Is this cake suppose to be sweet? I’m not a big fan of frosting so I left that off. I’m thinking maybe I needed it! This was not a favorite, but I am excited to make other other things! Abbe, thank you! This cake is just a bit sweeter than banana bread. 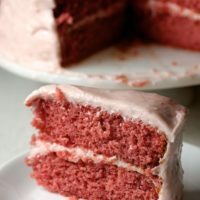 I think the frosting is just perfect, but I am a confessed cream cheese frosting fanatic. Happy baking! This sounds delicious. I love baking and will try this one. I think my 2 year old would love it. Hayley, you just need overripe bananas, not necessarily black. Usually, I deem them ready for baking when we are no longer willing to eat them. That generally means the bananas have a lot of black spots on them. Looking to make this soon, think I can use frozen bananas? Danielle, I’ve never frozen bananas. If you froze them when they were overripe, my guess is you should be able to thaw them and use them for this cake. I have been thinking about this little cake since you posted it..I had too many over ripe bananas and froze them. Each time I open the freezer, there is my reminder to make the little cake. So today is the day! For those in comments asking about frozen bananas, just freeze the overripe bananas in their skins and when you want to use them, simply place in a bowl or small dish to thaw, remove the skins and mash! Easy peasy! Made this today & it is amazing. I didn’t have three eggs so I substituted 1/4 cup applesauce for one egg, used vegetable oil instead of canola and added peanut butter to the frosting. It was delicious!! 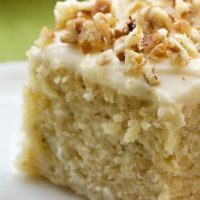 I have a similar recipe for banana cake that came from better homes and gardens mag that has a browned butter frosting. it is out of this world!!! it just has butter browned in a skillet, powdered sugar, vanilla and a touch of cream. i dont know the exact recipes. 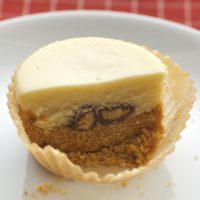 can this be baked in a 9×13 pan without doubling ? Karen, a 9×13 is essentially twice the volume of an 8×8, so you’d need to double the recipe. Using gluten free flours I converted this recipe for my husband. It was wonderful! Baked so nice! Even my mother who is sometimes skeptical to try try my gf goodies loved it! Thanks for a great recipe! My daughter requested I make this recipe for her bday cake for tomorrow’s celebration. Very easy! Although, I used two 8 x 3.5 loaf pans instead of one 8 x 8 pan. Just added 5 more minutes at 300*. Perfect!!! Will check back tomorrow after we blow out the candles. 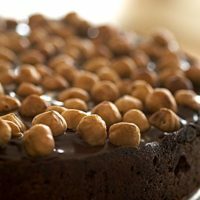 Im making this cake right now, and the edges of the cake are getting burnt while the center is still doughy. Just made this today! I’m really not a big fan of banana bread, but this has a nice mix of banana flavour and cream cheese. About the cake being too dense, I added 1/4tsp of baking soda. It came out fine, although I think the outside bakes much more quickly than the inside. So the inside was a lot doughy and had to be baked at a lower temp for longer. It came out pretty good though. I used a bundt pan and drizzled it with frosting, walnuts and pecans. Good recipe. I cut the confectioner’s sugar in frosting by half, though, was too sweet for me! Just baked this today and…yummy! Swapped the oil for vanilla fat free greek yogurt and still very moist. I doubled the recipe to make a layer cake, I only had 6 large bananas, so I added a few extra tablespoons of yogurt and it still has very good banana flavor. 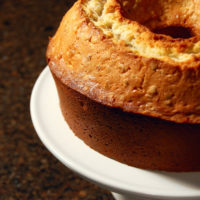 I think Deej’s comments on the temperature or bundt pan are great as I had a small doughy center as well. Thanks! Added 4T butter to the icing. Yummy! Thank you. I had a friend and her children over this weekend and had many over ripe bananas so I went to my Pinterest board and decided to make this cake. My gosh it was sooo good. super easy to make. I followed to recipe to a T… almost I had to use egg substitute as my son is anaphalactic to eggs and tree nuts. It was very moist and had a light sweetness about it. The topper was the cream cheese icing. I will def make this again. The cake was extremely dense. Followed the recipe to a tee. I will look for other recipes. Disappointed. Frosting was very tasty. I would love to make this into a 9 inch round cake. Will the bake time need to be adjusted? 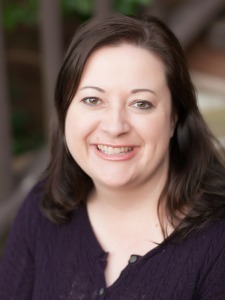 Hi, Jeannette! You shouldn’t have to adjust the baking time. The volume of the two pans is very comparable, so the cake should have the same thickness in either pan. Best. Banana Cake. Ever. Based on other reviews, I added 3/4 tsp vinegar to the milk. I also added a teaspoon of baking soda to alleviate the issue with it being too dense. It was amazing!!! Thanks for the great recipe!! I too found this recipe on Pinterest and am so glad I didn’t read the comments before I baked it. The cake came out very moist. My husband loved it! He suggested next time to add the nuts in the cake instead of on top, and no frosting…this cake stands on its own! Will post on my blog with a link to yours! I am looking for recipes that will become family favorites, and this one will definitely be! Thanks! I gotta try this. 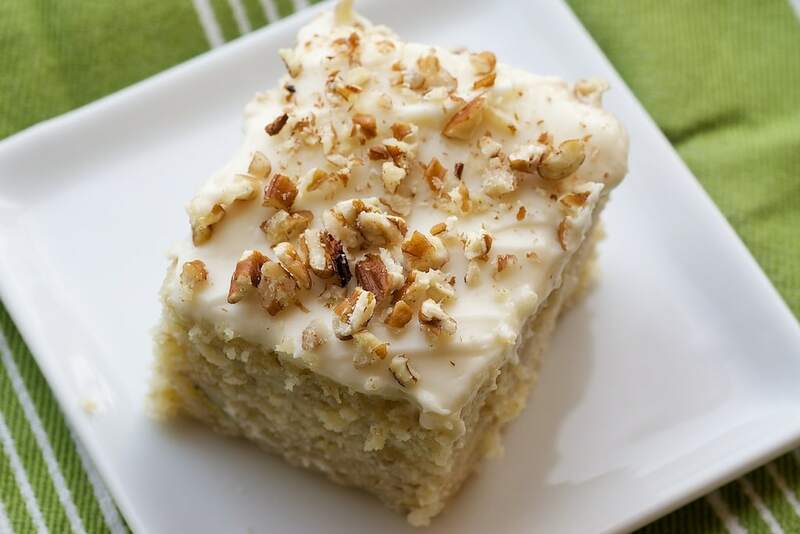 I have to ask though…how do you make this banana cake without the flecks? I just hate those in my banana bread or cake. This one looks lovely – all fluffy and moist. Hi, Jean. Those dark flecks are just cooked banana. If I had a super close-up shot of a slice of this cake, you’d see that there are plenty in there. Great recipe. I read in previous comments that the cake turned out to be too dense. The recipe calls for 4 bananas but I only had 2. The cake came out nice and fluffy! The density could be due to the density from the bananas. Thanks for sharing! I just tried this recipe and It was a epic FAIL! Way to dense I thought maybe I missed something so I read the recipe again, I have no idea what happened. Made this banana cake tonight it is PHENOMINAL! I substituted 6 tbsp. of canola oil instead of using the butter , still came out fluffy and moist. Will be making this again ! I made this cake & it’s cooling!it looks delicious. It did crack on top but I can’t wait to smother it with cream cheese frosting!! Ok, my cake was not all that great. It was more like a gummy heavy banana bread texture, and the frosting was more like royal icing. A buttercream would probably go better. Either way, I’d probably use that type of frosting, and I’d use cake flour, instead of regular, so it won’t be soooo dense. This looks so goo…I have a similar recipe that was my mothers’s but I only tried making it once. I live at high altitude, and it turned my banana cake into a banana brick…didn’t taste bad, but boy was it dense…any adjustments for altitude available? Hi, Pam. I don’t personally have high-altitude baking experience, but my guess is you need more liquid in the recipe. Try adding another egg. I will be using mashed bananas that were previously frozen. How much mashed banana is the equivalent of 4 large bananas? I would use 1 & 1/3 to 1 & 1/2 cups. Please, to gif a German Rezept! My roommate made this cake! It was absolutely delicious! She did not include the egg whites, and substituted confectioner’s sugar with granulated sugar and corn starch. Most importantly, she baked it for 20 minutes! Highly recommend it! Mine was sticky I baked for twenty minutes over and everything….what did I do wrong? Hi, Rachelle. It could one of several things. Did you change anything about the recipe? Even a small change can cause big problems. Have you used an oven thermometer to verify your oven temperature? If it took longer to bake, that could be the problem. Did you weigh or measure your flour? Sticky sounds like it might need more flour. Thank you for posting this recipe. I tried it last night and it came out great! After reading the comments here I decided to add a tsp of baking soda. I also changed the temp to 350 and shielded the cake with aluminum foil once it started browning. The result was a delicious moist cake. I baked this cake tonight and it turned out amazing! I did make a few changes since I was afraid of a dense cake. I used a bundt pan at 350 which finished in 30 minutes (though my oven tends to be a bit on the hot end). I also added 1 tsp of baking soda and used laban (fermented yogurt/milk) in place of regular milk. for the frosting, I reduced the cream cheese frosting in half starting with 1/2 cup of conf. sugar and adding until it was mildly sweet and runny in consistency since I also prepared a dark chocolate frosting to glaze the cake. It had the perfect amount of sweetness to please everyone in the house. I will definitely save the recipe for another occasion. I’m looking forward to trying this recipe. I want to double it though. How long would you recommend that I bake it in a 9×13? Thanks! Hi, Connie. The baking time shouldn’t vary that much. It might need maybe 5 minutes to make sure the center is done. Just check it with a pick to determine if it’s done. I made this today and it is divine! It is dense, not too sweet, and the frosting is the perfect touch. I doubled the recipe and made two of them, one to pop in the freezer. I used two ripe bananas, the rest were previously frozen and thawed today. I have a new favorite way to use up over ripe bananas now! Thank you! I’m not a great baker but I made this cake and it came out perfect! it was a complete success, I’m making it again today for a friend’s birthday. Thanks a lot for this recipe! So glad you liked it, Lucia! Before giving this a try, I’m just curious….for those who added 1 tsp baking soda to the cake…. Did you omit the baking powder? I don’t have any baking powder & really don’t want to waste all the other ingredients by ruining the cake. I don’t know what to do…help! Just about ready to take this out of the oven & ice it. I don’t have nuts in the house, would toasted coconut work….or would that be a conflict of flavors? Hi, Lori. Coconut sounds good to me! Took note of all the posters who said it was a dense cake…..made 2 cakes one with baking soda and one without and it’s true…..the one with baking soda came out lighter, still a little dense but very moist. I’ve always made banana cakes with baking soda and I think it really needs the addition of this ingredient. Very nice but not the best banana cake I’ve tasted. Thanks for posting though I’m always up for trying new recipes. Hi, I would like to make this for my soon to be 3 year old’s birthday party but wanted to cut down on the sugar. Would you have any recommendations? 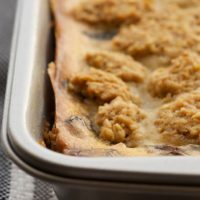 Could I use applesauce to sweeten instead of sugar? What proportions would you recommend? Thanks! Hi, Becky! I don’t do much sugar substitution, so I can’t give you an experience-based answer. I would suggest finding that kind of substitution information from a source with good, proven experience with those kinds of substitutions. I made this last night and followed the recipe as directed, unfortunately mine too came out very very heavy. I was hoping for a light cake like recipe. its so nice to have recipes for 8×8 pans. Most are to big for the two of us. I’m making this tomorrow! Thanks!!! I have a few tips for this dense cake/ banana bread recipe. use butter milk if you don’t have it use 1 cup milk and add 2Tbls vinegar or lemon juice and let it sit 5-6 min. you can also put it in the freezer after baking for 10-15 min for the cooling processes it helps keep it moist just don’t forget it. 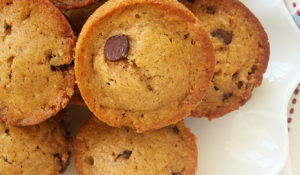 when ever your baking banana bread, cake, or muffins USE BUTTERMILK you have to activate the baking powder, if it doesn’t call for both baking powder and baking soda most banana baking recipe’s call for baking soda…. It was more than dense… I threw it out. The frosting was also much thinner than any cream cheese frosing I’ve ever made. ALL the love and ALL the feels for the supreme density of this lightly glazed gem!! It gives the same euphoric feeling as noshing upon a thick warm cinnamon roll! I was so pleasantly surprised! I gave my 21 month old son a little smackerel of the cake and I’ve never heard him say “Mmm!” like he did! Thank you so much! No more wasted bananas EVER!!! I subbed coconut sugar for the white, 5 small/medium bananas for the 4 large, and added about 1/2 cup more confectioner’s sugar in the icing (singing while adding to the KitchenAid a 1/4 cup at a time). PERFECTION!! I made this today and it came out very dense…to the point it was doughy in the middle like it wasn’t done….although the toothpick tested clean and baked according to the recipe. I was very disappointed as I would love to find a light and airy banana cake recipe. Sorry….I won’t make this again. Good Grief, this was delicious! 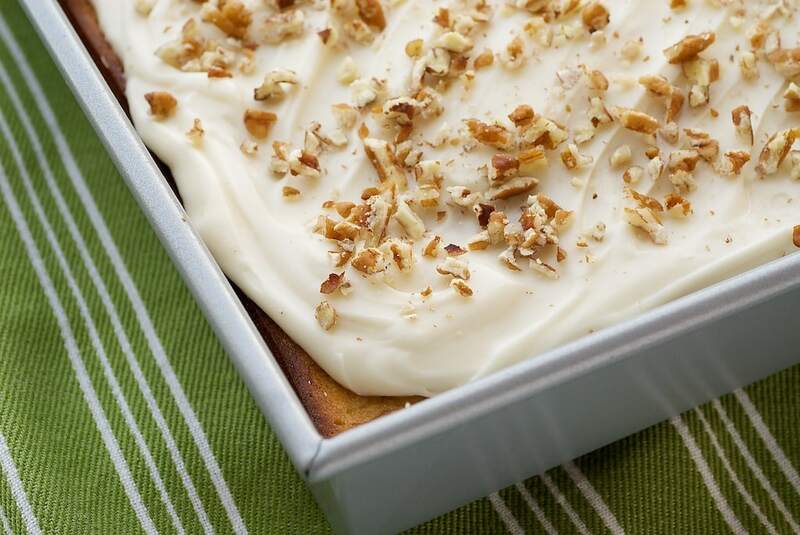 I was looking for a bar cake so I took your recipe exactly as it was and spread it out on a 9 X 13 baking sheet. Only needed 30 mins baking time. It came out about a half inch thick. Perfect! Then I doubled the icing recipe to cover the entire sheet and sprinkled with toasted walnuts! Everyone loved it! Thank you Jennifer! Oh and the comments about it being dense crack me up. It has 4 large bananas in it, of course it will be somewhat dense, that’s what makes it great! This cake is delicious! I only used 3 bananas because it was all I had left and it was just enough. I used a whole stick of butter instead of a half and 2 tbsp of coconut oil. After reading the comments, I put a dish of water in the oven as the cake was baking to make sure it was moist and it truly is! 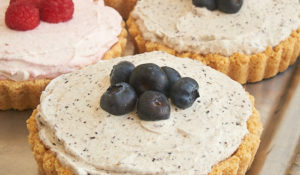 Hi, do you know what substitutions I would need to use to make cupcakes instead of cake? Thank you. Hi, Molly. You don’t need to make any substitutions in the recipe. The baking time will likely be about half of the suggested time for the cake.